Savour the Holidays with Canadian Turkey! Whether it is a grand celebration with family and friends or a quaint and quiet one you are having this year, a meal is something everyone likes to sit down to during the holidays. Not sure what to serve for your holiday meal? Canadian Turkey has plenty of ideas to help make your meal for the holidays no matter how many people are tucked in around the table. Looking for fun and festive appetizers to serve at your holiday parties this year? 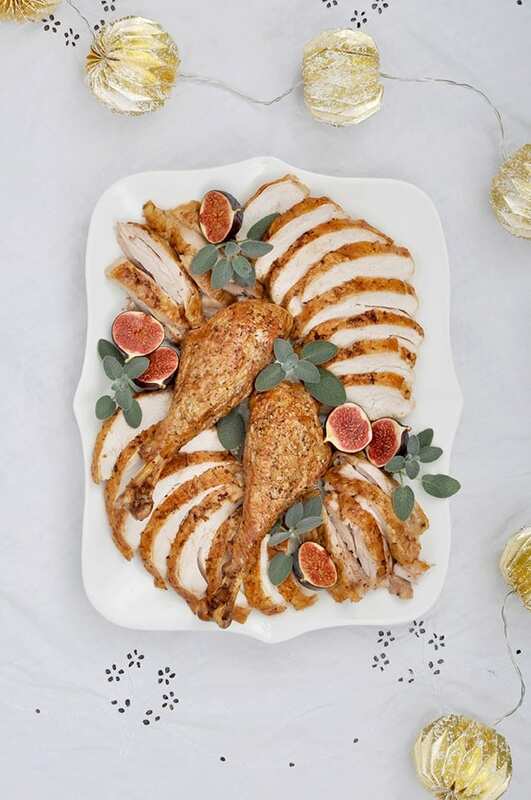 Canadian Turkey has a bevy of recipes to get your celebration off to a fabulous start! Want to spice things up? Take a look at these chic Bacon Wrapped Turkey Bites with Cranberry Chipotle BBQ Sauce. For a comfy and cozy affair, try out these Turkey Tartlets with Cranberry Salsa or pop these Potato-Topped Turkey Meatloaf Bites. Give guests a bit variety by serving them these turkey Bombas and a Trio of Dips! Any of these tasty bites are sure to make your gathering festive and fun! If a sit-down celebration is what you had in mind for the holidays, Canadian Turkey has you covered! They know that a holiday meal can take a lot of planning and preparation to pull off a delicious meal while having time to take care of other details for the day. Canadian Turkey has shared this “Make it Faster” Festive Carved Turkey recipe that will shorten the amount of time you spend in the kitchen. Dress with olive oil and a light sprinkle of salt and pepper. Pat the turkey parts dry with a paper towel. Combine dry spices to make a rub. Sprinkle generously on both sides of the turkey parts. Spread your turkey parts skin side up around the pan. Make sure to leave room between the pieces to allow heat to circulate. If using any fresh herbs, tuck in around the parts. Roast turkey for 30 minutes at 425F. Lower heat to 350F and cook for an additional 1- 1½ hours until an instant thermometer inserted into the thickest part of the breast reads 170F. Remove from heat and tent for thirty minutes before carving. •	Tuck garlic under turkey parts to ensure they don’t burn. •	Get your local butcher to break down your turkey for you. This is an economical way to use a whole bird for parts, with no extra work for you! •	Make sure to get the carcass, neck and wings from your butcher to make a rich and tasty turkey stock. •	If your local grocer doesn’t have a butcher on site, you can use turkey parts for this recipe. Make sure to stock up on extra dark or white meat, depending on what your family prefers. •	Make a quick gravy: Pour off pan juices and let sit for 2-3 minutes until fat rises to the top. Skim off fat. Blend together remaining pan juices and vegetables to make a delicious gravy. Add a ½ - ¾ cup of broth or milk, 2 tbsps of cornstarch and heat until thickened to desired consistency. Not only is this recipe a time-saver, it is can also help to keep some coin in your pocket! This recipe can be a perfect centerpiece of your holiday festivities. Is this your first year preparing the “Big Bird?” Canadian Turkey can give you a hand here, as well! They have a WHOLE BIRD HOW TO page that shares tips and tricks for cooking your turkey from store to table. Whether it is appetizers, a small meal or a meal you are thinking about creating for the holidays, Canadian Turkey has you covered! They have amazing ideas to add turkey to your festivities this year that will please anyone who tastes them. Take a look and see how Canadian Turkey can make your holiday celebrations festive, merry, and deliciously memorable! For more information about Canadian Turkey, you can connect with them on their Facebook, Twitter, Instagram, Pinterest and YouTube pages! A Canadian Turkey Holiday Giveaway! Canadian Turkey wants to start the holiday season off right by giving one lucky Ottawa Mommy Club follower a $150 Amazon.ca e-Gift Card to create a festive holiday tradition! This giveaway is open to Canadian residents and ends at 11:59 EDT on December 3rd, 2016. The squash-turkey-zucchini-soup sounds delicious. I must try this. For the holidays I love a roast turkey stuffed with veggies and lots of gravy. My tip is to buy a big one for leftovers to use in other recipes. I think I’d like to try the Twice Baked Turkey Dijon Baked Potatoes recipe for the upcoming holidays. My favourite recipe is the Christmas Dinner Pizza. Cheesy Tomato and Turkey Bake sounds great! I actually like the Whole Bird Calculator they have on their site. It’s a valuable little tool. The recipe that I would like to try is the Beer Can BBQ turkey. That looks so delicious!! My favourite recipe is the Turkey Breast in the slow cooker, love that it is easy to do and the meat turns out moist. Plus it frees up the oven for other things. We are white meat eaters so this works great for us. Peach Glazed roasted turkey breast sounds delicious and easy too!! I love all the leftover turkey recipes. The Asian Greens and Turkey Broth with Frank’s Red Hot Slammin’ Sriracha looks interesting. We have a lot of dietary needs/restrictions in my household and that is one we could all enjoy! My favourite recipe is Sweet and Sour Turkey oven fried drumsticks. Tomato and Turkey Bake sounds great!!! This would be different to try and i’m open to new ideas!! When cooking turkey, I like to stuff it with oranges to keep it moist and fragrant. I would absolutely love the Honey Garlic Turkey Tenders with Sweet and Smoky Dipping Sauce. Would love the Cheesy Tomato and Turkey Bake. I really like the Peach Glazed roasted turkey breast, sounds really good and looks easy to make. The simple, classic DELICIOUSLY SIMPLE HERB ROASTED TURKEY looks like a crowd-pleaser to me! Love the addition of white wine to the broth! I would love to prepare the SLOW COOKER TURKEY CHILI WITH SWEET POTATO, CHIPOTLE AND MAPLE for my family i think we would enjoy this meal ! My favourite is simply roasting a whole turkey for the holidays, then making turkey soup with the leftovers. I love the Whole Bird calculator on the website for knowing what size turkey to buy depending on how many guests, as well as the temperature and time cooking chart. The recipe for the SLOW COOKER TURKEY CHILI WITH SWEET POTATO, CHIPOTLE AND MAPLE looks and sounds really tasty! A great recipe is the APPLE, CHEDDAR & TURKEY HAND PIES. I love turkey pies. I love the turkey kabobs! My cooking tip is buy the stuffing in a box ;). So much better! I visited Canadian Turkey at http://www.canadianturkey.ca, and my favourite holiday turkey recipes are the ones for leftover turkey. The PEACH GLAZED ROASTED TURKEY BREAST sounds yummy. My tip is to be prep all your food before you start cooking to save time and sanity! I love the weeknight turkey taco recipe! It is quick, easy to make and offers flavours my family loves! Cheesy Tomato and Turkey Bake sounds divine!! I’d like to try the Peach Glazed Roasted Turkey Breast. Smoked Turkey wraps, but with a vegetal protein instead on the turkey. BATCH TURKEY MEATBALLS sounds like a great Holiday lunch! Twice Baked Turkey Dijon Baked Potatoes look good. I’m loving the TURKEY TAQUITOS recipe, might try this one this year if we have lots of leftovers. Peach Glazed Turkey Breast sounds amazing! I’d want to try that recipe for sure. I’d like to make Squash, Turkey and Zucchini Soup! omg Turkey Taquitos for sure, I am always looking to switch up our taco night! The Peach Glazed Roasted Turkey Breast looks amazing! our family favourite is the day after a turkey dinner when we have a turkey shephards pie made with all the leftovers from the day before. I like making turkey curry meatballs with green curry. I appreciate the link on how to carve the whole turkey–very helpful! I would love to try the Christmas Dinner Pizza. For the holidays I love a classic roast turkey. On the site I like the look of Whole Roasted Thanksgiving Turkey with Mustard Gravy, as the mustard gravy seems like a bit of a twist at least for us. The sweet and spicy turkey looks great! I truly enjoy the SQUASH TURKEY AND ZUCCHINI SOUP recipe. I like making a hash with the leftover turkey ! I think the Hearty Turkey Sausage and Tomato Risotto sounds fab. An unusual twist on using turkey left-overs. The caesar turkey schnitzel sandwich sounds interesting. I would love to make the Turkey Taco Pizza recipe. I love the how to videos ! So great to not just read the tips but see them , that helps so much sometimes ! I think the Potato Topped Turkey Meatloaf Bites look really yummy and fun to make! The turkey sliders recipe looks really good. I’ve actually never cooked a whole turkey, we have a small family, but I have used it in place of chicken with a caesar salad! I think the Peach Glazed Roasted Turkey Breast looks amazing! I like the SAUSAGE AND PISTACHIO STUFFED TURKEY BREAST ROAST recipe. I think I’m going to try making the Skillet Turkey Scaloppini Topped with Mustard, Capers and Olive Sauce tonight because it sounds delish! I make slow cooker turkey chili – anything on a worknight that is easy is a hit! Christmas Dinner Pizza sounds very interesting. I used leftover turkey to make turkey pot pies. I love hot Turkey Sandwiches using up leftovers! have a pot luck, that way you aren’t cooking forever in the kitchen! The Twice Baked Turkey Dijon Baked Potatoes recipe looks great! http://www.canadianturkey.ca/recipes/spicy-peanut-noodles-with-turkey/ Looks and sounds so tasty! Cook the turkey with a mayo rub. It keeps the turkey super moist and tastes really good too. I like the Turkey spinach cobb salad. Those turkey Taquitos would make an amazing holiday Appetizer! I like the sounds of the SWEET CHILI & LIME TURKEY MEATBALLS recipe; it would be great for holiday entertaining! My fav cooking tip is Turkey Farmers of Canada recommends cooking a whole turkey to an internal temperature of 170°F (77°C) in the breast and 180°F (82°C) in the thigh. From the CanadianTurkey website, one of my fave recipes is Turkey Chili! I never thought to make chili with turkey before! My tip is to boil down the turkey bones to make a turkey soup. Making stock with the bones is an easy and money saving idea I liked! I make turkey pot pie, homemade turkey soup and more with left over turkey. I learned that after thawing it should be cooked within 48hrs. I want to try the Hearty Turkey Sausage and Tomato Risotto! Peach Glazed Roasted Turkey Breast sounds yummy! The Cheesy Tomato and Turkey Bake looks good. I find cooking a fresh turkey yields the best results. I’d love to try the Peach Glazed Roasted Turkey Breast. As for cooking tips, don’t let me cook (hahaha). The Turkey Tacos look delicious! My favorite holiday turkey recipe is Sweet & Spicy Oven Fried Turkey Drummettes. My favourite would have to be Cheesy Tomato and Turkey Bake. It looks so delicious, especially when it has my all time favourite in it. Macaroni! Every time I visit their site I find something else that catches my eye. I like the sweet and spicy oven fried turkey drumsticks! The turkey taco pizza looks delicious! Il ove sandwiches. I’d like to try the BBQ Turkey Club with Spicy Mayo. Yum! The turkey croque monsieur with cranberry apple chutney looks amazing! I grew up near a cranberry bog, so I love finding ways to add the little red berry to recipes. I love to try the CHEESY TOMATO AND TURKEY BAKE, it looks delicious and it’s easy to make! I would like to try the Shredded Turkey Tacos. Using the bones for soup stock!!! I would like to make the Potato-Topped Turkey Meatloaf Bites, they look smashing. My favourite holiday turkey recipe is grilled apple ‘n’ honey turkey. Cheesy tomato and turkey bake looks like a great way to use up the yummy leftover turkey. we would love the turkey tacos, turkey is our favorite! I love Roast Turkey, but my favourite thing is left-over and making interesting and delish dishes. On the Canadian Turkey website, the Turkey Taquitos and the Turkey Tortilla Cones look really yummy! I would like to make the Potato-Topped Turkey Meatloaf Bites, I think my picky 17mth old granddaughter would actually eat them. I’m obsessing over the ‘Sweet Chili Lime Turkey Meatballs’ Yum-Yum! I’d like to make the turkey taquitos. I have cooked salmon on a plank in the BBQ but never thought to cook turkey on a plank, so I liked the how to tips on how to cook your turkey by this method. It would add even more flavour! Italian Turkey Burgers sounds like something I would like to try. I think the turkey taco pizza is neat. I wouldn’t have thought of mixing turkey with taco seasoning, or of putting it on pizza! The Spicy Turkey Tartlets look very tasty. The Best Ever Turkey Chili looks delicious! My favourite holiday turkey tip is to freeze the carcass and make the stock later. We like to make curry with the left-overs. Turkey Chili looks like it would be very interesting. I made bacon wrapped turducken breast roasts for our last two thanksgivings! They’re so good & not hard to do at all! My favourite tip for cooking a turkey is to use a meat thermometer to make sure it is cooked properly. The shredded turkey tacos look really good. I like serving tacos as they are easily adapted to everyone’s differing tastes! I remember one year we deep fried the turkey outside in a big pot of oil. It was the most juicy, yet crispy-skinned turkey I have ever eaten! I would make Shredded Turkey Tacos with my leftover turkey! They look delish! I will be bookmarking the turkey calculator. Makes it so easy to figure out how big a turkey I will need and how long to cook it for. That’s brilliant.